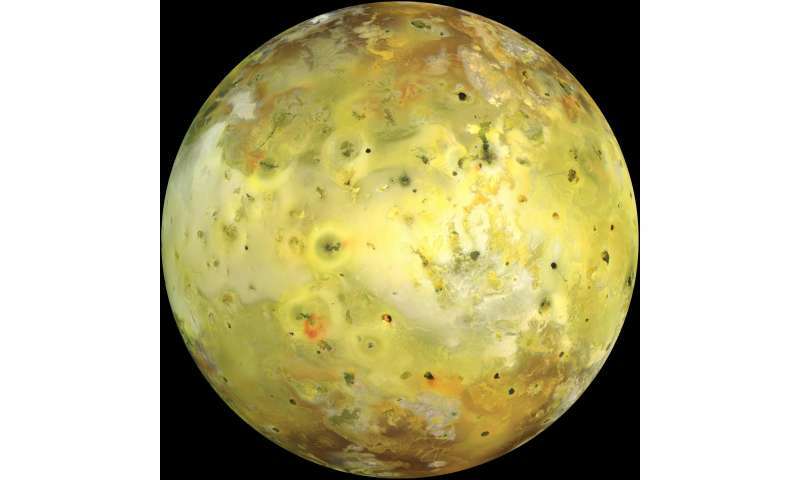 Mountains aren't the first thing that hit you when you look at images of Jupiter's innermost moon, Io. But once you absorb the fact that the moon is slathered in sulfurous lava erupted from 400 active volcanoes, you might turn your attention to scattered bumps and lumps that turn out, on closer inspection, to be Io's version of mountains.There are about 100 of them, and they don't look anything like the low lying volcanoes. They also don't look like mountains on our home world. While we favor majestic ranges stretching from horizon to horizon, the mountains on Io are isolated peaks of great height that jut up out of nowhere. From space, they look rather like the blocky chips in the fancier kind of chocolate chip cookie. "The planetary community has thought for a while that Io's mountains might be a function of the fact that it is continuously erupting lava over the entire sphere," McKinnon said. "All that lava spewed on the surfaces pushes downward and, as it descends, there's a space problem because Io is a sphere, so you end up with compressive forces that increase with depth." The numerical experiment described in Nature Geoscience tests this hypothesis through simulation. "People have been squeezing planetary interiors forever to see what happens," McKinnon said, "but we're applying the squeeze differently, because on Io compression increases with depth; the surface is not in compression. We thought we could mimic this by beveling in the edges of a box, squeezing it as you might an accordion. "It's a neat demonstration of how things might actually work," McKinnon said. "The compressive forces deep in the crust are incredibly high," Mckinnon said. 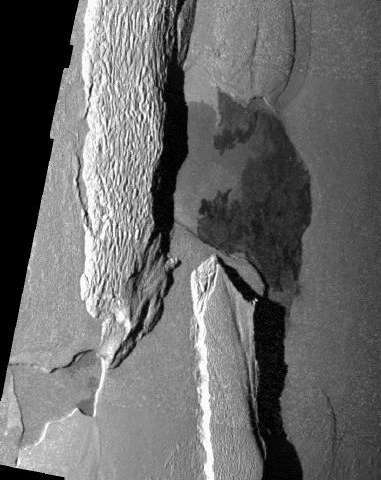 "When these faults breach the surface, those forces are released, and the entire stress environment around the fault changes, providing a pathway for magma to erupt." 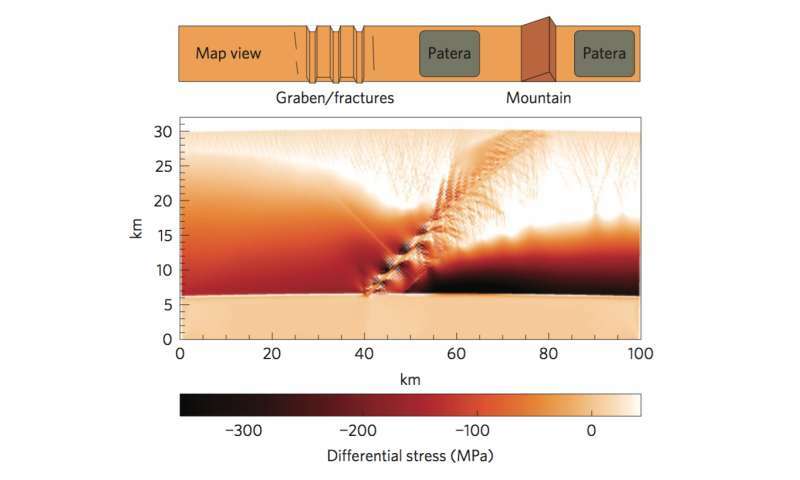 The model might also explain why the mountains are associated with shallow, irregular depressions called patera. "When the stress environment changes," McKinnon said, "a magma chamber can form at midlevel in the crust. When this magma surfaces along the fault, the crust above the chamber collapses, forming the patera." The model of mountain building also explains some of the "extensional" tectonic features on Io, such as "pull apart" mountains. These are mountains that have split in two parts that have shifted with respect to one another. "If you look at a big map of Io," McKinnon said, "there are concentrations of mountains and concentrations of volcanoes, and they kind of nest into one another. Even though mountains and volcanoes are often found together, if you look at all of the mountains and all of the volcanoes, they're anti-correlated. It's a peculiarity of Io." Why might this be? It's not just the increasing weight of the overlying lava that puts the deep crust in compression McKinnon said, but also the increasing temperature. "Heating at depth causes the rocks to want to expand, and since there's no room to expand, you again get compressive forces," he said. If all of this seems very alien, it is. 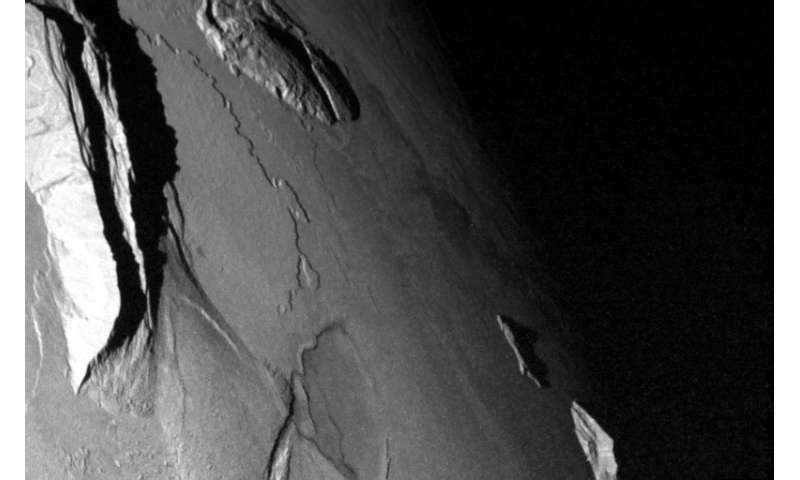 "It's a novel mountain-forming mechanism that we don't see elsewhere in the solar system," McKinnon said. "But the same kind of thing could have happened on Earth, when it was very young and entirely covered by a shallow ocean," McKinnon said. "Because there was still lots of volcanism, mountains like those on Io might have burst through the ocean. They might have been the first emergent land on Earth," McKinnon said. ".. Sulfurous lava erupted from 400 active volcanoes .."
Sulfur can not be hot and be in liquid aggregate state (melting point 112 ° C, boiling point 444 ° C). Io has no lava and volcanoes like Earth already cold outbreak of matter. This is confirmed by temperatures that are in line with other moons of Jupiter. So what have the melting and boiling points of sulphur at 1 atm got to do with Io? The lava is produced below the surface, i.e. under considerably more than 1 atm of pressure. That will change your boiling point, for instance. Water boils at 100 C at sea level. At the height of Everest it is around 70 C. In the deep ocean the boiling point will be considerably higher, due to pressure. It's a nonsensical comparison to use the figures you've used.